With China’s “Jade Rabbit” lunar rover making tracks on the moon (and in history), is your child asking about space? Do you want them to? Help them Play-Watch-Read to connect your youth to this significant event. My daughter and I love this matching game after several months of use. It contains a space theme that focuses on planets and other space objects (playable in the free version). It wins for its simplicity, clean look, clear vocals (North American accent), displayed spellings and customizable game settings (i.e., number of cards to match). I endorse Amazing Match for ESL/EAL learners, too. Astronaut Chris Hadfield turned heads this year – upwards – toward the International Space Station. His out-of-this-earth videos examine elementary topics such as the five senses in space but he also demonstrates what happens when you cry without gravity and he conducts an amazing surface tension experiment (designed by Grade 10 students from Nova Scotia). My daughter loved these videos even as she was turning three. A young boy blasts off for a fictional trip while learning non-fictional info. There are many moon facts (distance, weather, craters, how you drink and walk with less gravity) and the illustrations bring shape and colour to your child’s imagination. 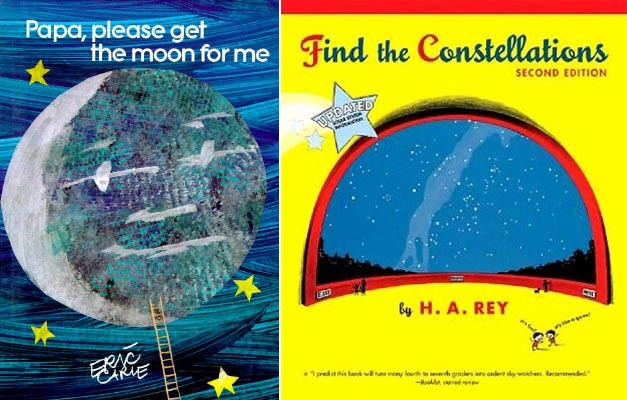 I also recommend Find the Constellations by H. A. Rey (the Curious George creator) and Papa, Please Get the Moon for Me by Eric Carle. Remember: Reach for the moon. Even if you miss, you’ll land among the stars. Which aren’t anywhere near the moon. Nice going, moon reacher; Houston has enough problems as it is. Loving the Play-Watch-Read connection to the moon/space theme! Thanks, Claudia. I figured HK parents would have children asking about Jade Rabbit. The Shenzhou 5 was massively popular with Hong Kong students in 2003. She’s really enjoying the app! Nice, Mr. J! That app surpasses so many other memory ones since it displays text and pronounces words very clearly. Hard to get bored of it with so many themes, too. This entry was posted on December 19, 2013 by theguestroom in Uncategorized and tagged Canadian Space Agency, China, Chris Hadfield, Faith McNulty, FOX Sports, H. A. Rey, If You Decide To Go To The Moon (Booklist Editor's Choice. Books for Youth (Awards)), International Space Station.